Emika Chen’s luck is truly down and out. She has no money to her name and she’s about to be evicted from her crappy apartment. 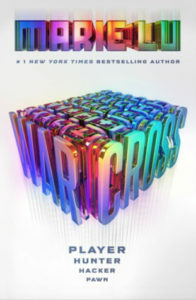 In one last ditch effort to try and raise some serious cash, she hacks into the Warcross Championship opening game. In doing so, she’s put on a path that will change her life. She’s asked by Hideo Tanaka to come to Tokyo and compete in the games, but also be his own personal bounty hunter; for someone has a sinister plot to destroy Warcross. As she delves deeper into the game, she realizes people aren’t who they seem and trusting them might be the key to her downfall. GUYS GUYS GUYS. This book! There was really no exaggeration as to people raving about it. It was SO GOOD! As I was reading it, I was enjoying it, but I couldn’t see what the hype was about, but then the ending just gets you! There were some things that I completely predicted, but others that just threw you for a LOOP! This was my first Marie Lu novel. I’ve had her other books on my TBR for ages and if they’re anything like this one, I’m getting to them ASAP. I really liked Emika. She’s smart, resourceful, and refuses to give in when everything is pitted against her. In fact, I really liked all the characters. Hideo was especially interesting, but the other Warcross players equally so. I’m hoping we’re going to see more of them in the upcoming installment. The plot moves rather quickly. Although, it took a little while to get into it at the beginning because I’m not usually a Sci Fi kinda girl, but the coding sections are done really well. It just moves little slower at the beginning than the rest of the novel, but believe me–it picks up. Like I said, I predicted one obvious aspect of the novel that had me thinking, “Really? This is it?” But then she hits you with a whopper of a twist that has you dying to get your hands on the sequel. I know so many people have been raving about this book and rightfully so. GO AND GRAB IT THE SECOND IT COMES OUT. I read this in a day and I’ll probably reread it because REASONS.